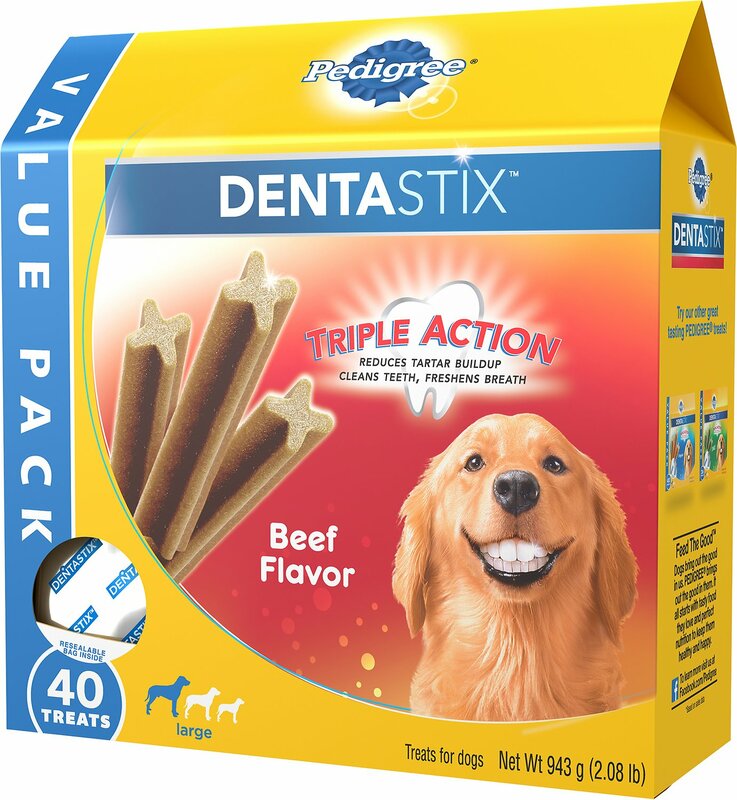 Pedigree Dentastix Beef Flavor Dog Treats are chewy, textured treats that are designed to promote oral health. 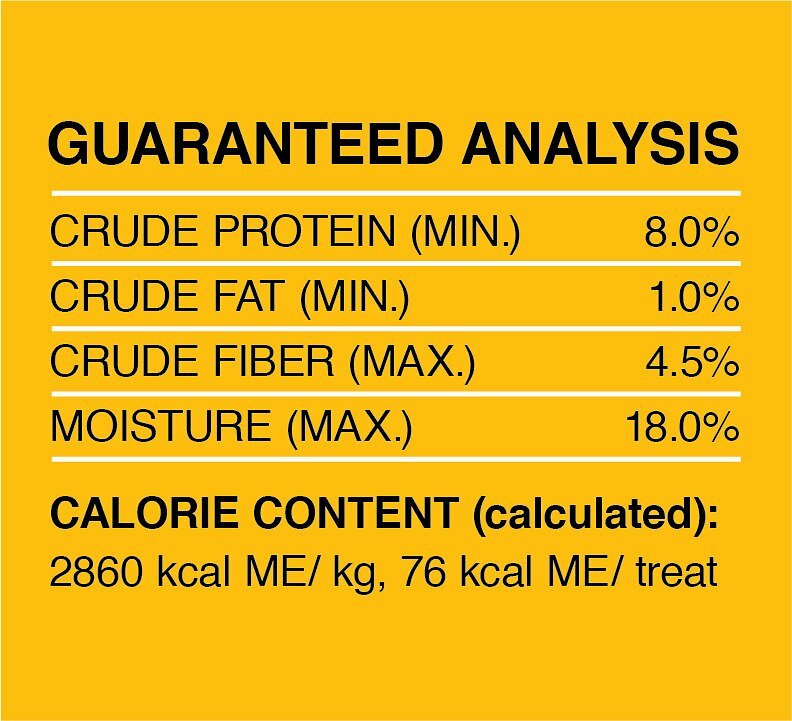 They are X-shaped, stick-like snacks that deliver daily oral care efficacy, with a tasty beef flavor. 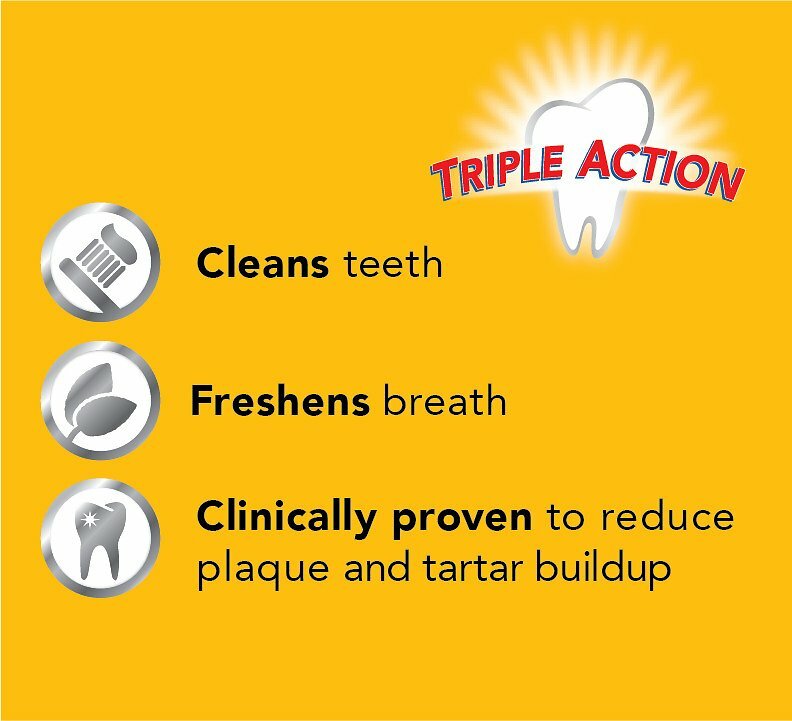 Their unique texture is clinically proven to reduce plaque and tartar buildup. 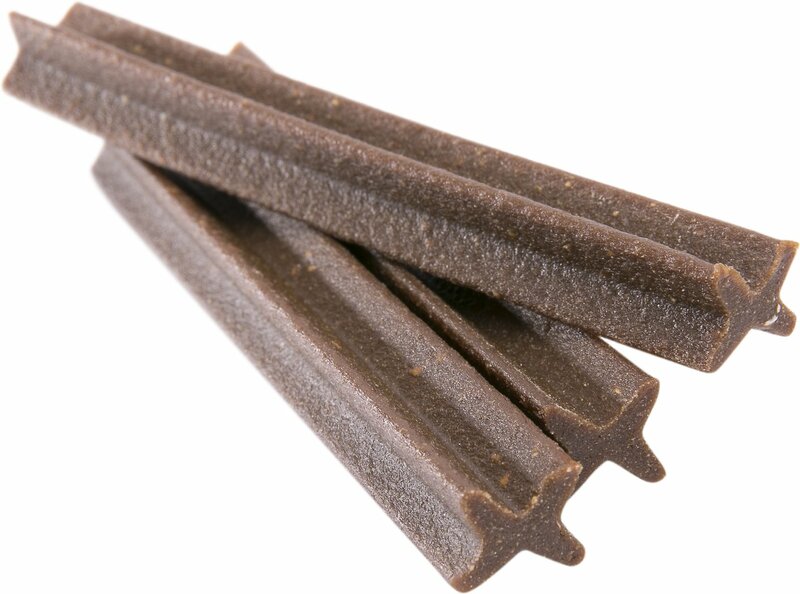 Great for maintaining your dog's dental health, while rewarding them with a tasty treat! 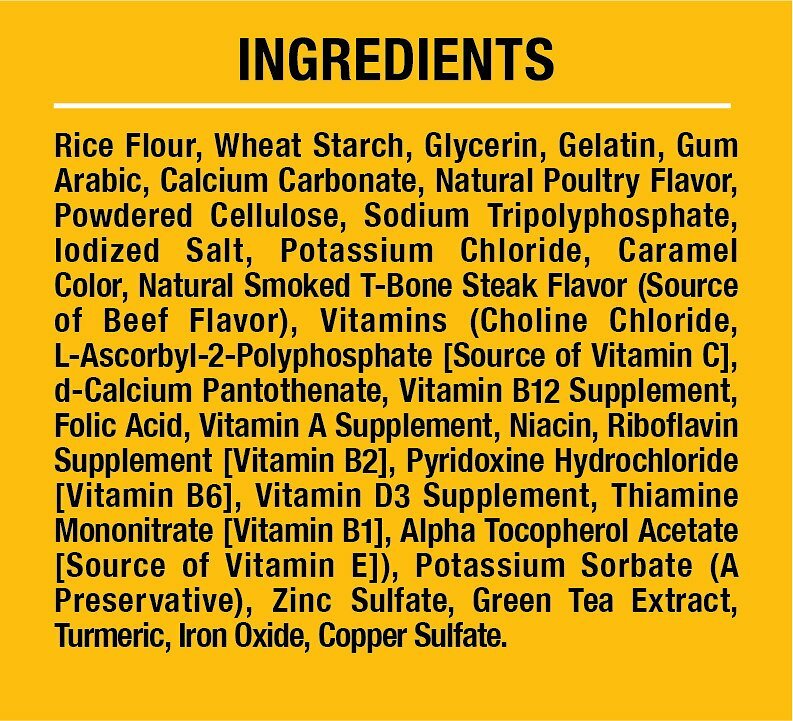 Rice Flour, Wheat Starch, Glycerin, Gelatin, Gum Arabic, Calcium Carbonate, Natural Poultry Flavor, Powdered Cellulose, Sodium Tripolyphosphate, Iodized Salt, Potassium Chloride, Caramel Color, Vitamins (Choline Chloride, L-Ascorbyl-2-Polyphosphate [Source of Vitamin C], D-Calcium Pantothenate, Vitamin B12 Supplement, Vitamin A Supplement, Niacin, Riboflavin Supplement [Vitamin B2], Pyridoxine Hydrochloride [Vitamin B6], Vitamin D3 Supplement, Thiamine Mononitrate [Vitamin B1], Folic Acid, Alpha Tocopherol Acetate [Source of Vitamin E], Natural T-Bone Steak Flavor, Smoke Flavor, Potassium Sorbate (a Preservative), Zinc Sulfate, Green Tea Extract, Turmeric, Iron Oxide Color, Copper Sulfate. 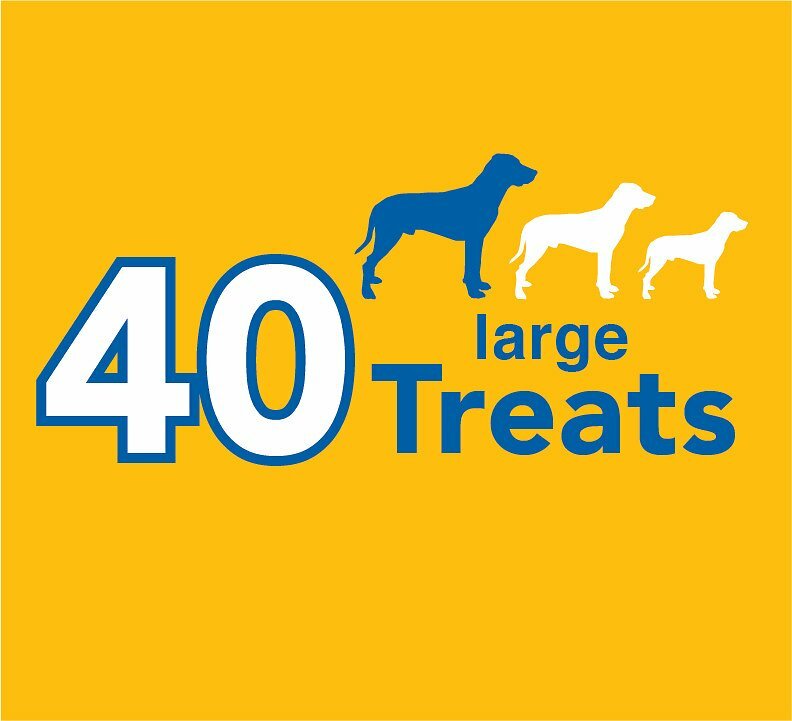 Feed large Adult dogs (30+ lbs) 1 treat a day. Not suitable for puppies and dogs under 30 lbs Fresh drinking water should always be available. My dog loves these. 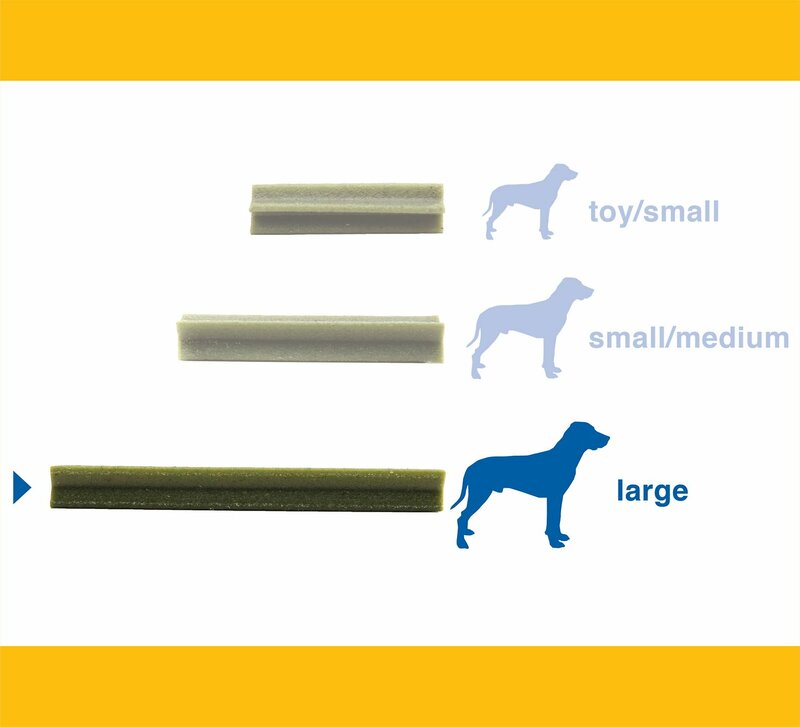 What I also like is that, because it's so easy to seal the package and keep the chews pliable, I can divide each into 1/2 or 1/3, depending on the type of treat I want to give her. The only recommendation I would make is to make them grain-free so my other dog can enjoy them. I give my American Staffordshire / Akita mix a stick every morning. This has been his routine for years and he will not let you forget to give him one either. I rotate between this and the other flavors to mix it up a bit, but he loves them all! The boys love the Beef flavor, and even though the box says for large dogs, my 17-21 pound dogs both wait for these each morning. No fuss dental care, great product! We’ve always given our dog a small, daily treat but this one... our dog goes nuts and walks us over to the cupboard to reminds us! Bonus - it cleans her teeth. Win/win! They are just too big for my baby! He loves Dentastix, but I ordered the wrong size. My mistake-not theirs. I will be donating them to a much larger fur baby! The large ones didn't last more than 40 seconds in my dog's mouth (50 pound lab). He likes them, but wouldn't buy them to help with dental care. If your dog is not a hard chewer, I guess these would be ok. Buddy LOVES Dentastix & gets one every night after his dinner & we tell him it's BRUSHING his teeth after his meal LOL! 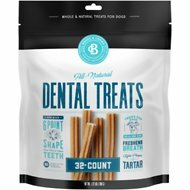 My girl loves these treats and they help keep her teeth clean. Gets one every night and she know exactly when that time is. they are great my dogs love them both of my dogs go out and go potty in the morning and run back in like lightning because they know they are going to get a treat to clean there teeth. My two dogs love these treats and I love that it helps keep their teeth clean. 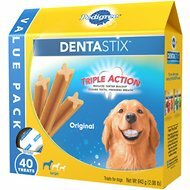 It's very hard for most dog owners to find the time to brush their dogs teeth, so it is nice to be able to give your dogs a Dentastix and feel your doing something good for them.